Tu B’Shevat, which marks the new year of the trees, began the evening of Jan. 30. At a time when most Jewish people no longer work the land, educational programming around Tu B’Shevat focuses on the values the holidays symbolizes, such as environmentalism, sustainability and connection to the land of Israel. For the holiday, the Kaiserman JCC put up a tree made of crumpled paper, surrounded by quotes about the environment from religious texts such as the Mishnah and Pirkei Avot, and gave out different fruits and nuts, like raisins, dates and almonds, as snacks. People also had the opportunity to write letters to the tree and donate money for a tree to be planted in Israel. Krulik said she wanted to put on an activity that anyone, regardless of age, could connect to. Abrams Hebrew Academy also observed the holiday in a unique way. 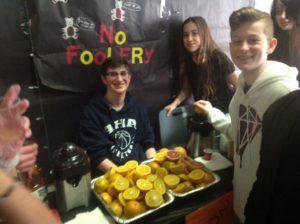 The school set up a shuk, with eighth-grade students acting as vendors. Rabbi Joshua Ottensoser, Judaic studies associate principal at Abrams, said he was inspired to put this shuk together after seeing a video showcasing the seven species of Israel — wheat, barley, grapes, figs, pomegranates, olives and dates — at the popular Mahane Yehuda Market in Jerusalem.